Runebound is a competitive game. While all the players want to avoid a defeat via the scenario overwhelming them all, it's still every hero for themselves. But many people these days like cooperative games. It lets everyone be on the same team and you win or lose together as a group. Also, sometimes your whole gaming group bails on you and you're left alone with nobody else to game with. Well, the Unbreakable Bonds expansion brings both cooperative and solo play to the world of Terrinoth. It is available now. Just this morning, I learned that a coworker doesn't like ants. And by that, I mean she haaaaaaaaates them. She got goosebumps just at the mention of them. And while they're not specifically ants, I'm sure the giant swarms in Unbreakable Bonds, the upcoming expansion for Runebound from Fantasy Flight Games, will give your heroes the chills, too. In this preview, we get a look at the Locust Swarm scenario. Most board games out there are competitive. All the players are looking to be the one that wins. However, sometimes you aren't wanting to take down your opponents, but team up and take on the game, itself. Or, everyone cancels on you and you find yourself wanting to game, but nobody's around. That's where cooperative and solo games come in. Originally, Runebound was neither of those things (cooperative or solo). But with the Unbreakable Bonds expansion, it will be. Hello Saturday. The Chuck Mangione from yesterday has switched over to Danger Doom, because that's the sort of mood I'm in. Other than that... not much happening on this side of the screen. A chill Saturday on a chilly Saturday here in Atlanta (seriously, we've actually got winter for a couple days before it's supposed to get back up to the 60s next week). But for the moment, let's get you some game reviews. Today we have: Runebound: Fall of the Dark Star, Runebound: Caught in a Web, Castle Panic: Engines of War, Pests, Gloomhaven, Mysterium Digital Edition, Insider, Hands in the Sea, Villages of Valeria, and Covert. Fantasy Flight Games has a nice batch of new releases available for you this week. If you're a fan of either RuneBound or Descent, you'll want to check it out. If you're a fan of their The End of the World RPG series, you'll also want to check it out. And if you're a fan of their Lord of the Rings card game, you, too, will want to check it out. Even with just the main box set, Runebound offers a lot of replayability, what with all the different quests that can come up at different times, the different heroes you can be, and the different pieces of equipment you can buy. But, if you're like me, you want even more variance. That's where the various expansions come in. 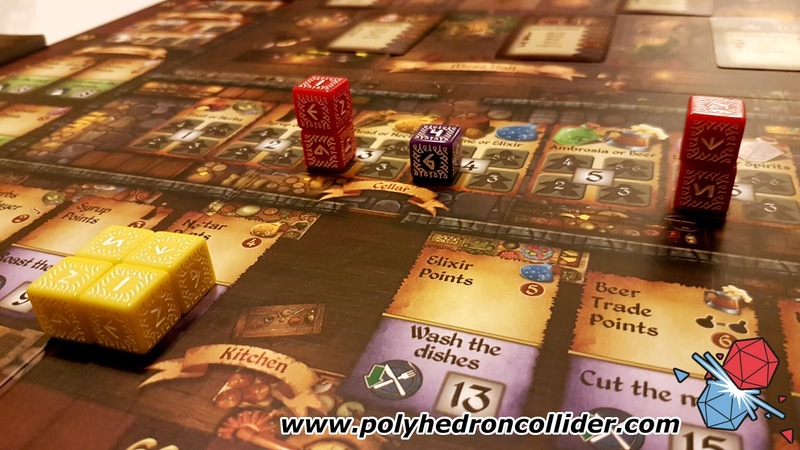 The Mountains Rise is one that you can integrate with any scenario you choose to play. And it's that set we get a preview of today. 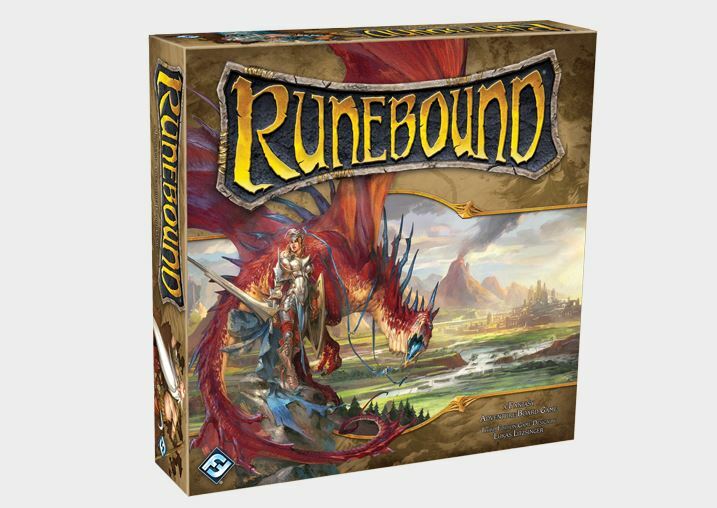 Big, adventure board games like Runebound offer an entire day's worth of gaming in a single package. There's quite a bit of replayability right in the box, what with all the different heroes, equipment, and skills you can choose from. But any game, if played often enough, can start to feel a bit stale. That's when a little newness injection, in the form of an expansion, can really bring a game back to life. Fantasy Flight Games is coming out with two expansions soon for the game. The Gilded Blade, the first Adventure Pack expansion, is what we get a look at today. I've mentioned before that I'm not really afraid of bugs, but I don't go out of my way to deal with them, either. I'll squish a spider if I need to, but I'd prefer if they just stayed where they're at and left me alone. Well, most people in Terrinoth would also prefer if bugs left them alone. Unfortunately, the sorceress Ariad has brought forth a wave of creepy crawlies and it's up to the heroes of Runebound to deal with them. 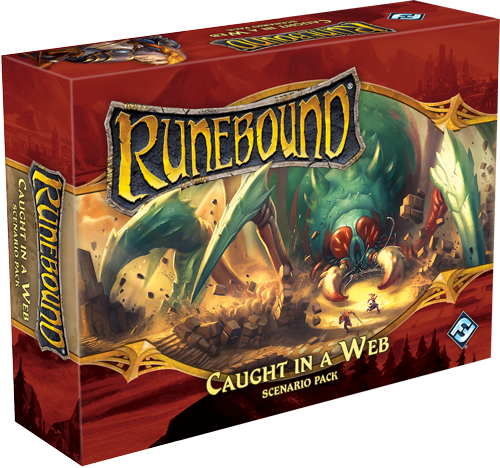 That's the story behind Caught in a Web, a new expansion for Runebound, of which we get a preview today. Terrinoth just can't catch a break, it would seem. Just when your adventurers have gone out and solved one set of problems, a new one shows up. Or, in this case, two new ones show up. 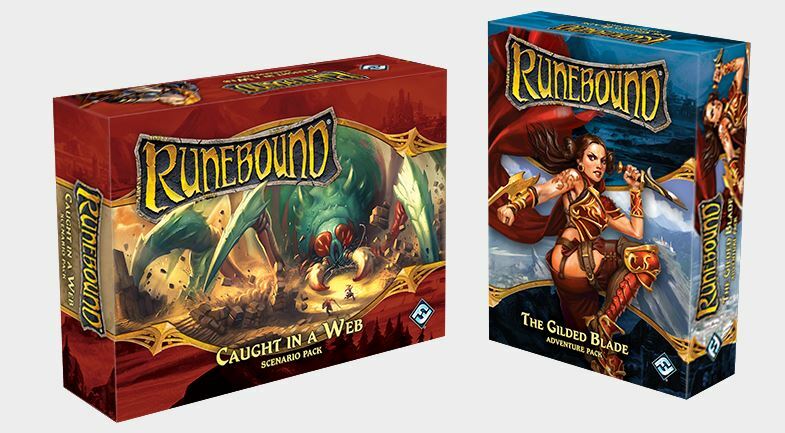 Fantasy Flight Games has announced two new expansion packs for Runebound. The world of Terrinoth, in Runebound, is full of adventure, excitement, and really wild things. Each time you play, you take on the role of a great hero about to head out on a great adventure full of danger, but also filled with an opportunity for phat loots. And now you'll have even more options when you play with a couple new expansions that Fantasy Flight Games has announced. Anyway! Yes! It's new news from Fantasy Flight Games. 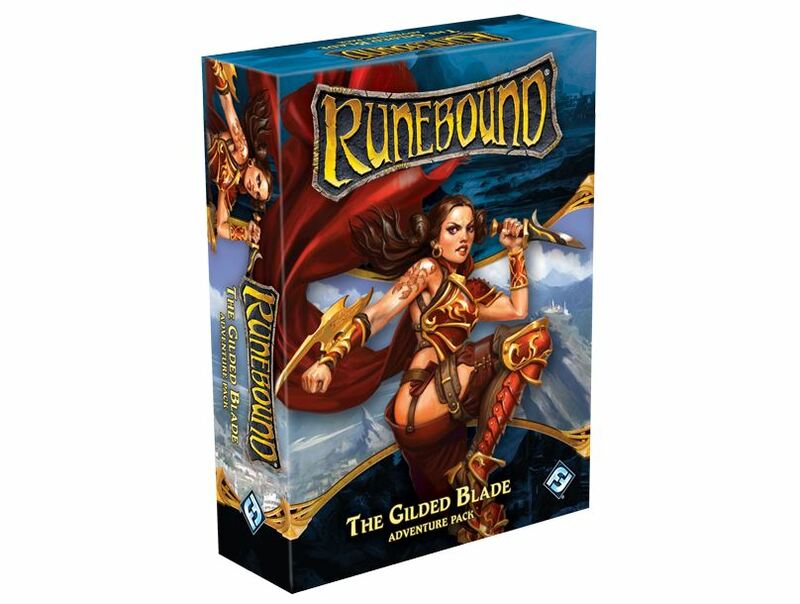 Runebound, their fantasy board game, is now available at retailers near you and from the FFG webshop. In Terrinoth, adventure awaits around ever corner. It is up to you greet it, with sword or rune. The Essential Collection for Runebound is now on sale! Begin your trek to your local retailer or our webstore and acquire your copy today. 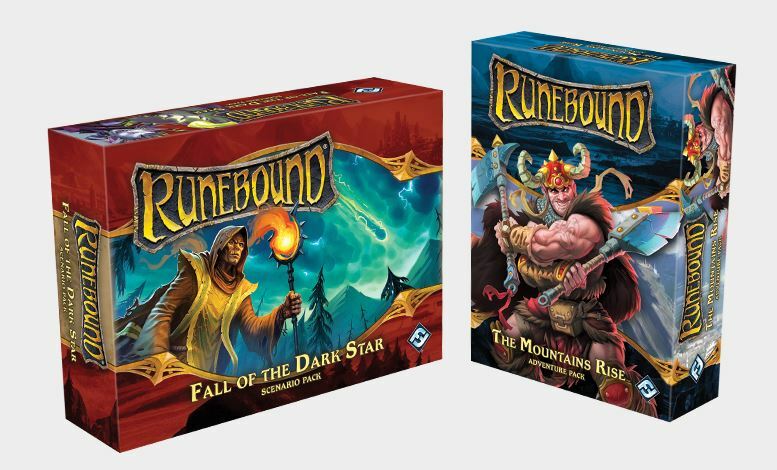 Featuring six previously released expansions for Runebound, the Essential Collection contains two new Adventure variants, telling the tales of The Cataclysm and The Seven Scions. With cursed stars falling from the sky and the threat of the Stormlords invading Terrinoth, heroes are needed more than ever. Each of these Adventure variants are comprised of new game rules and new Adventure decks that replace the Rise of the Dragonlords Adventure in the core set. These expansions not only tell new stories, but they give players new objectives and alternate win conditions. Also included in the Essential Collection are the Beasts and Bandits and Traps and Terrors Challenge card expansions. These two decks will add plenty of variety to your encounters and can be mixed in to the Adventures of your choice. Finally, the Essential Collection also comes with two Item and Ally card expansions, Weapons of Legend and Rituals and Runes. These decks add new cards to your Market deck, featuring new Item types and dozens of new weapons, allies, and artifacts. The rules (pdf, 1.5 MB) have been added to the Rundbound support page. 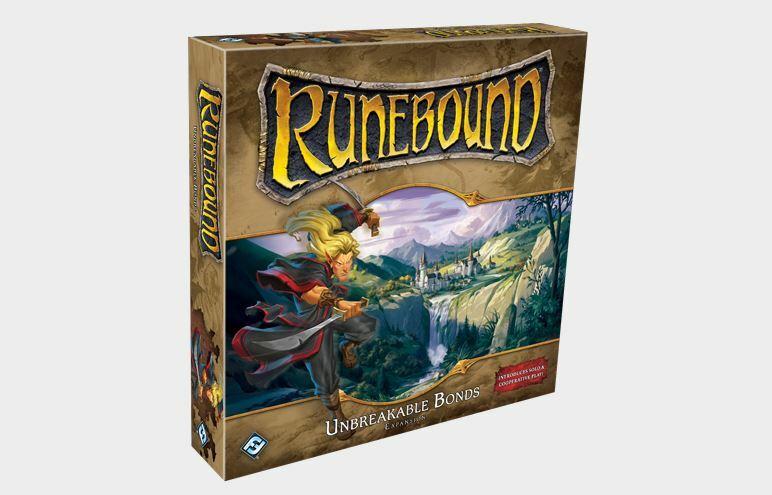 Head out to your local retailer today and secure this box of adventure for Runebound.